Western blot analysis of whole cell lysates probed with isocitrate dehyrdogenase 1 antibody (VMA00143) followed by detection with HRP conjugated Goat anti Mouse IgG (1/10,000, STAR207P) and visualized on the ChemiDoc™ MP with 60 second exposure. Arrow points to isocitrate dehyrdogenase 1 (molecular weight 46 kDa). Isocitrate dehydrogenase 1 antibody recognizes the isocitrate dehydrogenase [NADP] cytoplasmic protein, also known as NADP(+)-specific ICDH, NADP-dependent isocitrate dehydrogenase, epididymis luminal protein 216, or epididymis secretory protein Li 26. 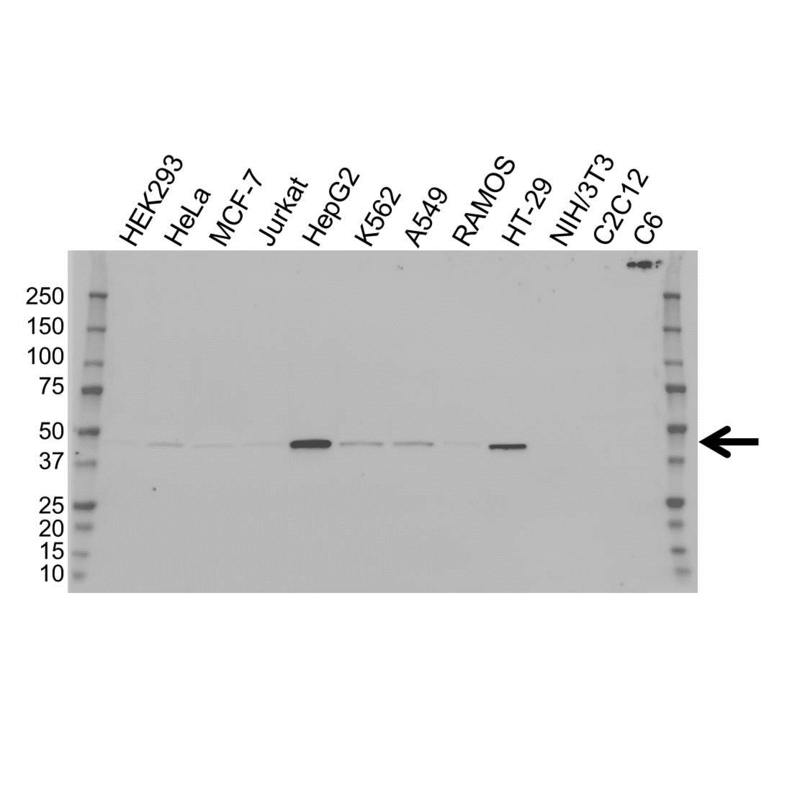 Mouse anti Human isocitrate dehydrogenase 1 antibody recognizes isocitrate dehydrogenase 1, also known as NADP(+)-specific ICDH, NADP-dependent isocitrate dehydrogenase, cytosolic, NADP-dependent isocitrate dehydrogenase, peroxisomal, epididymis luminal protein 216, epididymis secretory protein Li 26, isocitrate dehydrogenase [NADP] cytoplasmic and oxalosuccinate decarboxylase. Isocitrate dehydrogenases catalyze the oxidative decarboxylation of isocitrate to 2-oxoglutarate. These enzymes belong to two distinct subclasses, one of which utilizes NAD(+) as the electron acceptor and the other NADP(+). Five isocitrate dehydrogenases have been reported: three NAD(+)-dependent isocitrate dehydrogenases, which localize to the mitochondrial matrix, and two NADP(+)-dependent isocitrate dehydrogenases, one of which is mitochondrial and the other predominantly cytosolic. Each NADP(+)-dependent isozyme is a homodimer. Encoded by IDH1 gene, isocitrate dehydrogenase 1 is the NADP(+)-dependent isocitrate dehydrogenase found in the cytoplasm and peroxisomes. It contains the PTS-1 peroxisomal targeting signal sequence. The presence of this enzyme in peroxisomes suggests roles in the regeneration of NADPH for intraperoxisomal reductions, such as the conversion of 2, 4-dienoyl-CoAs to 3-enoyl-CoAs, as well as in peroxisomal reactions that consume 2-oxoglutarate, namely the alpha-hydroxylation of phytanic acid. The cytoplasmic enzyme serves a significant role in cytoplasmic NADPH production. Alternatively spliced transcript variants encoding the same protein have been found for IDH1 (provided by RefSeq, Sep 2013). Mouse anti Human isocitrate dehydrogenase 1 antibody detects a band of 46 kDa. The antibody has been extensively validated for western blotting using whole cell lysates.